Stuart, right is watching the bows dip as he bears away onto the reach at the windward mark at Grafham. The bows go down with the wind pressure on the boat (which has been slowed by the turn) but they will lift as Stuart slackens the main off more and the speed picks up. He shows no sign of shifting his weight further aft---so the overall "feel" must be that the boat is safe and he can predict it will lift. 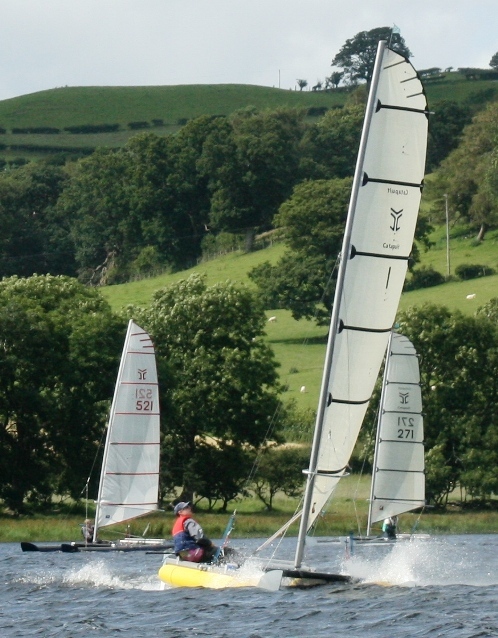 A gust (centre) puts both bows down. He leans back, but does not slacken the main, and feels it is not a crisis. (Above right) Seconds on, through the puff, the bows are up. More seconds on (left) the breeze is up again, with both bows slicing into the water, but Alex drives the boat hard, with time to check the sail setting. (Right) Seconds later again, Gareth reaches past the same spot. 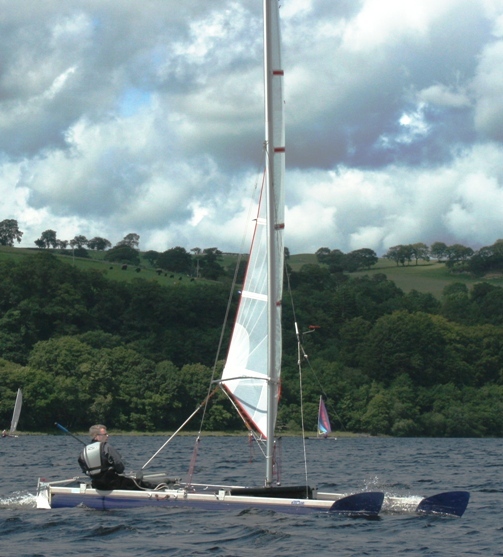 Although the boat is not dipping at the moment, he is sitting further back than Alex, needing (with his lighter weight) to sit aft to counteract a gust. Gareth comments that with the breeze strong and plenty of pressure in the sail, attention goes from the telltales to watching the lee bowboard. 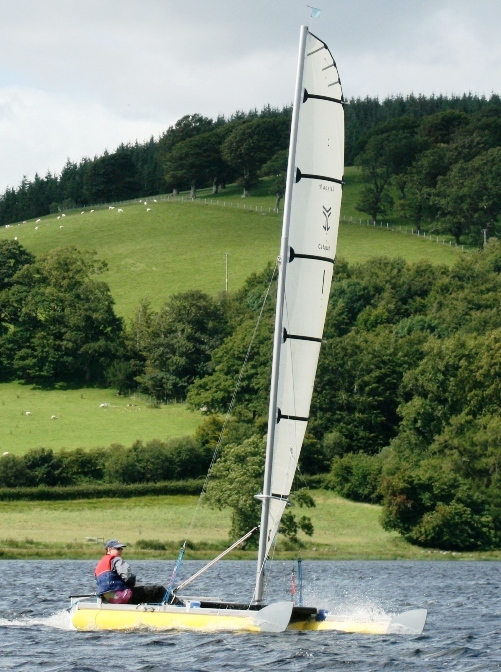 Until the "feel" of the boat's safety on a reach is familiar ( a combination of judging the speed against the wind strength, any sensation of the boat hesitating and checking as bows drive into the water, with good balance ready to move weight aft) a surprise can happen reaching in quite light winds. 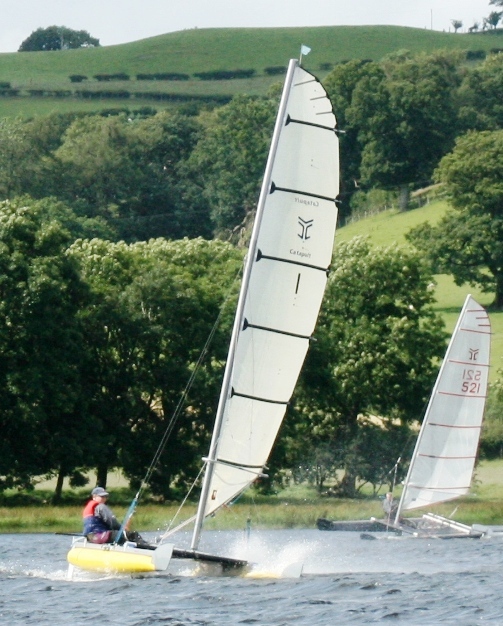 Alex comments from the pairs race at Bala, with Steve "enjoying a leisurely reach in around 10 mph of wind. He was fairly well forward, keeping the boat nicely balanced and trimmed....until a gust caught him. The bows dug in unexpectedly and before he knew it, he was tumbling forward, and then the boat was on its side. He could have saved the situation by quickly moving aft and also easing the mainsheet. 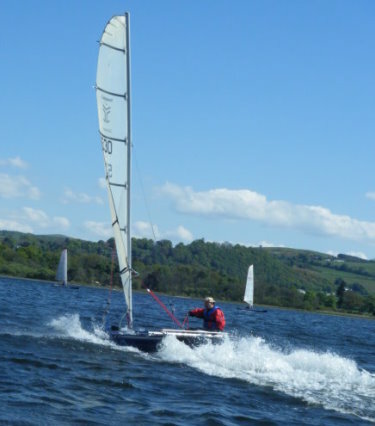 The bow would then have (hopefully) popped up and then the sail could be retrimmed and rapid forward progress resumed. 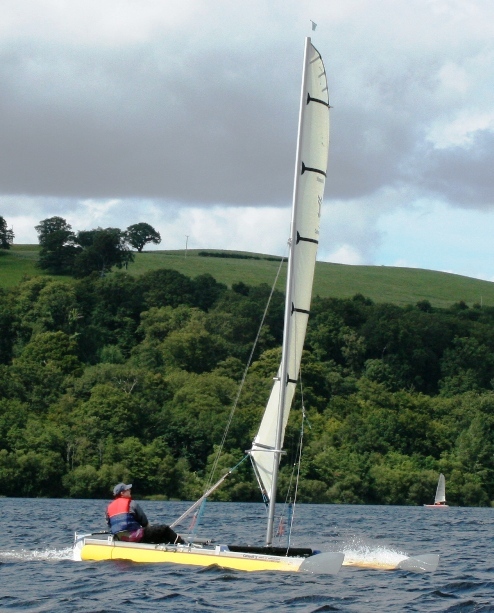 My advice when reaching is Be prepared to move aft quickly, if a gust comes If you are not powered up, to keep the boat balanced may mean moving inboard and forward Be ready to ease the mainsheet and reduce power. If the bow goes down, it is best to ease, let things re-settle and then engage power." (Left) There is obvious alarm, but the lee bow is probably burying after bearing away quickly before slackening the main---unless he is thrown forward by the boat's sudden slowing, the helm dumping the main should do it. (Right) Chris at Bass (with much more wind than it looks) has a bigger problem---he is on a broad reach, so the main is well out already and the gust is digging the boat in, with a great tumult of white water all around. It is about to nosedive, and probably hanging over the back is the only option. 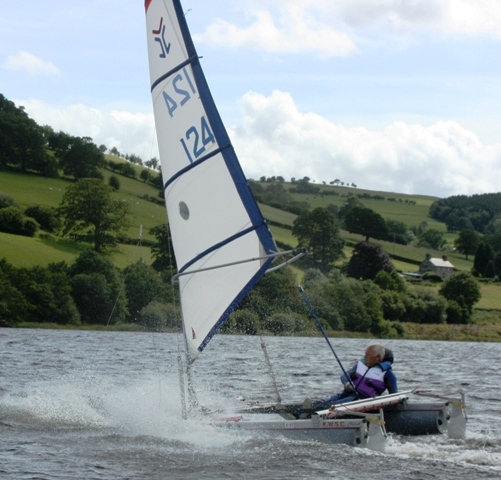 (Left) George Evans running at Bala: the whole boat has dug down into the water, so the forces on it are very great---there is the choice of leaning way back and hoping the gust dies, or rounding up violently, hanging over the back, so the boat can lift again, and be turned carefully back on course. In stronger winds, keeping speed up through the gybe (turning in a wide arc and gybing when running dead downwind, with the wind pressure at its least) allows an easy gybe when all the Lasers are going over. 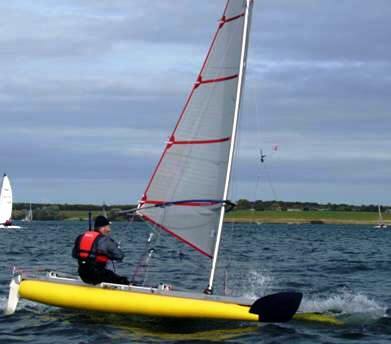 Catapult slows in any rapid turn, so wind pressure may dip the bows while weight and position are being shifted during the gybe. 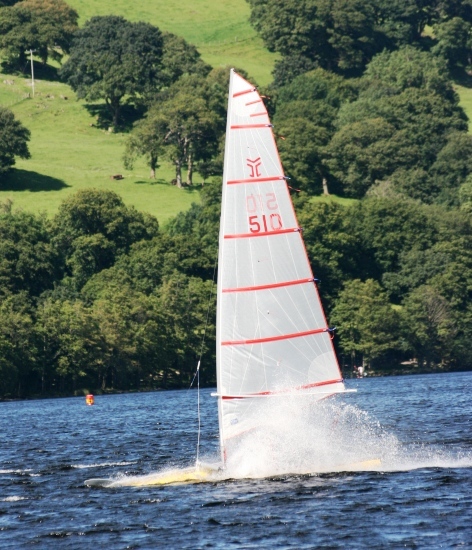 Reaching at sea in a moderate breeze, with a chop running, the boat can have green water coming over the lee bow board with no feeling of an impending dive. (Below) Alastair on a broad reach at Sheppey, sitting way back for safety. The boat is NOT going well trimmed like this, but he has just finished going 40 miles round the island, and is taking no chances about getting safely back onto dry land as soon as possible. Sometimes hanging over the back like this and accepting the slower stretches during lulls is the way to manage when dark gusts are all around the lake.